We can take a look at what God has said in His Word to find the traits and characteristics of those He blesses and those He curses. This is important! Most religions these days would have you believe that God and Jesus just “love everybody.” This is so far from the truth. God made it clear in Deuteronomy what one of those criteria for blessings and curses would be to the Children of Abraham. God also made it clear that there are those whom He hates, and those whom He loves. Just as Esau hated his brother Jacob because Jacobs ways were righteous and Esau’s were not, God hated Esau. With that in mind, let’s look at the “State of the Union”. Wow, that all sounds great, but isn’t Trump missing something? The shrinking middle class has been under siege for the last 50 years. Specifically, wages for the wealthiest have risen the fastest, while wages for the poorest have remained nearly stagnant. Meanwhile, poverty and homelessness are so bad that the United Nations conducted an investigation, normally something done in third-world countries, at the end of 2017 into the 40 Million Americans living in extreme poverty. The conclusions are mind-boggling and in complete contradiction to what Trump is touting. Are these results in line with a government going in God’s ways? No. The leaders, (all of them!) are running this country for their own personal benefit and that of their benefactors, not the peoples. What else did Trump leave out? The country’s debt, corporate debt and consumer debt are all at a record high. 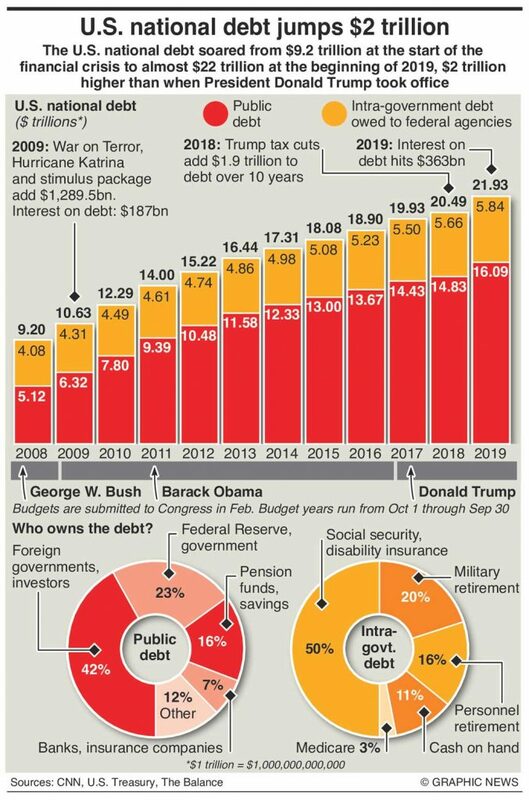 The debt has grown exponentially and continues unabated. Are these economic blessings? No. Where is all this money going? 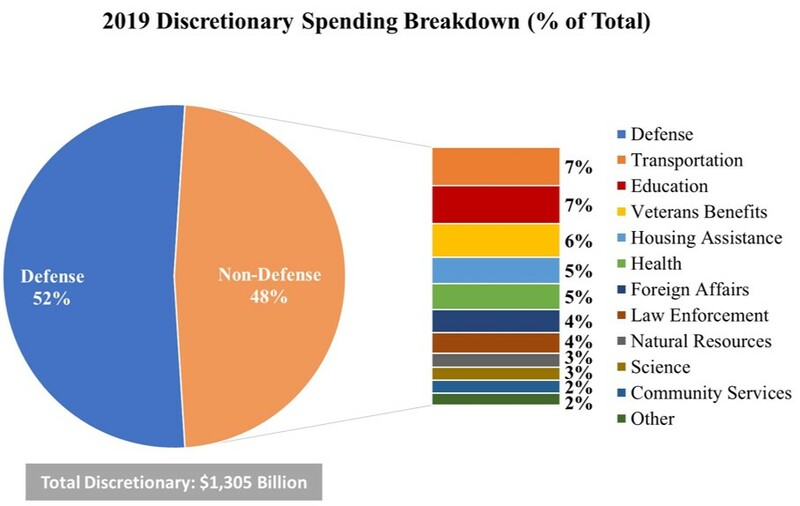 Here is your governments 2019 discretionary budget breakdown. Trump was sure to boast of the $700 Billion dollars in military spending for 2019 alone. America has entered the 18th year of the Afghanistan War, the longest running US war in history. Syria, Iraq, Iran, North Korea, Nigeria and recently Venezuela are in the cross-fire. Is this violence and threats of violence in line with God? No. The State of the Union is not strong. God is not blessing America. Just because a man, Trump, says “God Bless America” doesn’t mean God will do it or has already done it. Actions speak much louder than words. Going against the ways of God by funding violent wars while at the same time allowing 40 million Americans to live in abject poverty will not bring any blessings from God! What say you about the several times in His Word God commands people to commit violence? This is a dilemma for me since I totally agree with your conclusion. Peggy, this is a dilemma for many since those who teach God’s Word don’t know God or the reasons for anything He has done. They are the “false prophets” who prophesy lies in His Name (Jer 14:14). Some say God just “loves everybody” while others say the God of the Old Testament is violent. It does create a dilemma. “For your violence against your brother Jacob shame shall cover you, and you shall be cut off for ever.” (Obad 10) This is the proclamation against Esau and his descendants for their want to eliminate the House of Jacob, their own brethren. Jesus told the parable of the vineyard in Matthew 23:33-46. When you consider that all the Old Testament prophets, all the apostles but one and Jesus himself, the Son of God, have been sent by God and have been killed by the wicked. These are they earmarked to be destroyed. Jesus said as it was in the days of Noah, so shall it be at the time of the end. And God said to Noah, “The end of all flesh is come before Me; for the earth is filled with violence through them; and, behold, I will destroy them with the earth.” The only ones saved were those in the Ark with Noah! Those who weren’t paying attention were carried away by the Flood (Matt 24:38-39). It’s time to pay attention! The Righteous will rejoice while the Wicked will tremble!